No matter how you are built, these full leather lined boots with hidden 6" elastic/leather gussett will fit comfortably as your legs change do to heat, etc. Choose from black steerhide or copper, dark brown or black cherry goatskin. Non-skid soles with soft-sneaker like insoles are standard. Leather insoles with leather or non-skid outsoles are $200 extra. 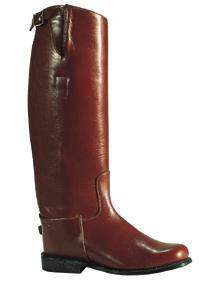 Polo Players and FoxHunters try our Brown Oiled Heavy Hide. Normal delivery is 6-8 weeks, rush delivery with shipment made within 28 days is $250 extra on either model. You can choose other toes and heels for this style also. Call us for details. For standard orders Click on "Order" button below to get the correct foot and leg size.